Publisher: HarperFestival Audio, 2004 (Original by Harper Collins, 2004; 208 pages). 12-year-old Annie loves to run. Not for the track team--definitely not for the track team!--but for the love of feeling her heart beat and her feet hit the ground. Running helps her cope in this year of change: her mother is pregnant, her grandfather is failing, and her best friend Max is even more grouchy than usual. But between the rhythmic thumping of her heart and, oddly, the art-class assignment to draw an apple for 100 days, Annie learns to find the continuity in change. Sharon Creech seldom disappoints, and this book is no exception. A short, sweet, story of a time of change (when is 12 ever not?) for Annie, the book offers no great insights into the world, but does offer some insights into living and being yourself. I thought that the apple was a brilliant touch, allowing Annie (and the reader) to see how through all sorts of change the apple retains its (pardon me) core essence. It's a lesson Annie is learning to apply to other things in her life, and the author doesn't ram it down the reader's throat--you have to see it for yourself. The narration is good; i.e., nothing about it sticks in my mind. That tells me that the characters were adequately rendered and the reading largely transparent. There were no technical glitches or oddities. The book doesn't give us huge issues or crises, making it suitable for younger readers, and if some of Annie's changes are specific to starting middle school, life changes at every age. I can recommend this for kids from 8 up. 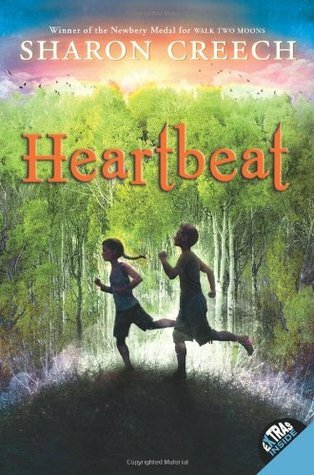 Full Disclosure: I checked Heartbeat out of my digital library, and received nothing from the writer or publisher in exchange for my honest review. The opinions expressed are my own and those of no one else. I am disclosing this in accordance with the Federal Trade Commission's 16 CFR, Part 255: "Guides Concerning the Use of Endorsements and Testimonials in Advertising." LOL--rather a different thing! I did see that this is not an uncommon title, and lends itself to all sorts of different takes! I love your reviews--always helps me find good things to read for my kiddos. Thanks! I'm glad they are helpful to someone--that is the point, but I wonder! Well done Rebecca. You always choose interesting books to review. Thanks! That's probably because I mostly review books that I picked up on account of them looking interesting. Even when I accept books to review for blog tours, I only accept those that look like something I'll enjoy. MG is one area where I don't know many authors/books, yet I have an 8 and a 10 year old. The 10 year old is mostly reading YA, but I love recommendations for MG books for both of them!